Hall Piano Company Presents a Hammond Organ Workshop Featuring Rev. Jimmie Smith November 21st. A comprehensive application of the Hammond organ will be presented by Reverend Jimmie Smith at a workshop at Hall Piano Company, 901 David Drive in Metairie, on Saturday, November 21st, 3:00-4:00PM. Sponsored by Louisiana’s exclusive Steinway & Sons dealer, Hall Piano Company, and the Steinway Society of New Orleans, the workshop is free and open to the public but seating is limited. The instrumental gospel/jazz genre is blessed with talent and a timbre that is generating attention nationwide. Jimmie Smith, native of Buffalo, NY, is a composer and songwriter that has created a new experience, Sanctified Sound, and is proving to be an example of multi-faceted gifting, diligence and persistence. At an early age Jimmie exhibited a superior aptitude for music. In 1982 his sister received a keyboard as a gift and it was Jimmie who sat down at his sister’s sweet sixteen parties, and began to play immediately. That was only the beginning; Jimmie went on play at his father’s church and was introduced to the Hammond B-3 which became Jimmie’s first love and choice of keys. Jimmie has played various churches throughout the United States. 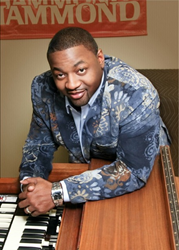 Over the years Jimmie has accompanied several gospel artists including Kim Burrell, Karen Clark-Sheard, Dorinda Clark-Cole, and COGIC international Music Department. Jimmie served on staff with the COGIC International Department for over seven years. The high-spirited first single “Going Up Yonder” is a declaration with an unwavering message of where one should be at the end of this life. “Mediation of Worship” reveals Jimmie’s love for worship style conveyed elegantly with soothing, alluring chording. Smith displays his diverse musicality with the jazz-infused title cut “Sanctified Sound”. Since 1958 Hall Piano Company has served families, churches and businesses across Louisiana and south Mississippi. As Louisiana’s exclusive Steinway & Sons dealer, their services include piano rentals and sales, acoustic and digital piano sales, piano lessons, method books and restoration. For additional information about the Hammond Organ Workshop and Reverend Jimmie Smith, contact Emily McWilliams at emilym(at)hallpiano(dot)com or call 504.733.TUNE.